A schematic drawing of the Sports Legends Experience at the Children's Museum of Indianapolis. Photo courtesy of The Childern's Museum of Indianapolis. 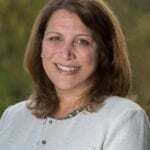 Kids who love sports will love Indianapolis – a city full of fun, sports-related things to do, including the new Riley Children’s Health Sports Legends Experience. Our Suburban TravelingMom got a sneak peek (it doesn’t open until mid-March 2018), and she says kids and families are gonna love it. A schematic drawing of the Sports Legends Experience at the Children’s Museum of Indianapolis. Photo courtesy of The Children’s Museum of Indianapolis. The Children’s Museum of Indianapolis is already one of the best children’s museums in the country. Now they’re going next-level. 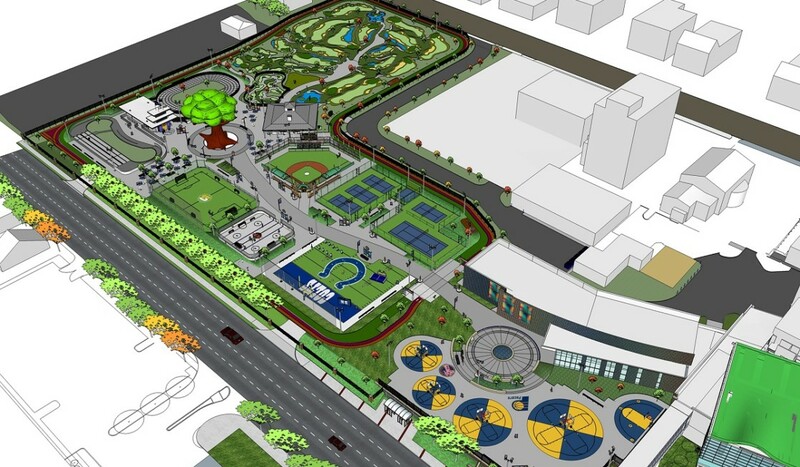 Alongside their building, they’re opening a $38.5 million, 7.5-acre family sports play area called the Riley Children’s Health Sports Legends Experience. It’s a really cool concept. Sorta like a family-friendly sportsplex. My sports-obsessed 12- and 14-year-olds got a glimpse of Sports Legend Experience, and in their words, it is “so cool” and “lit.” It’s a wide open area with 14 different sports families can play together, from drag racing to football. The crown jewel is the Pete and Alice Dye Golf Experience, a unique, 9-hole putting golf course you play with special putters. The golf legends designed the course to replicate some of the most famous holes in the world, including water hazards and varying turf heights. 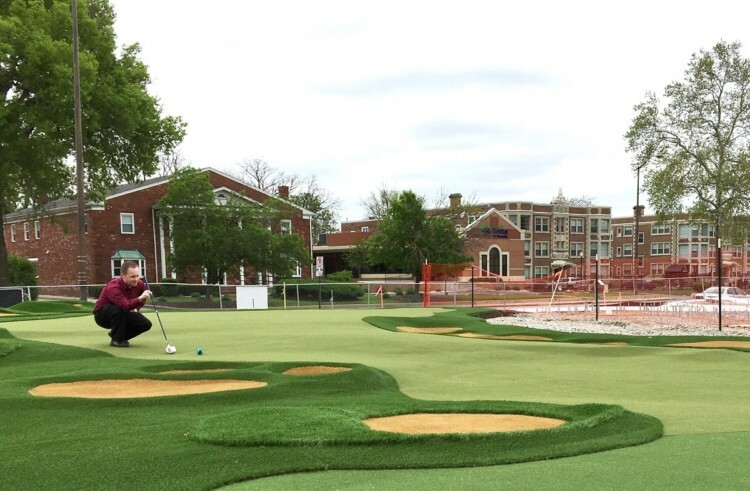 They’re putting the finishing touches on a unique putting golf course at the new Sports Legends Experience at the Children’s Museum of Indianapolis. Like the museum, each space is creatively done. 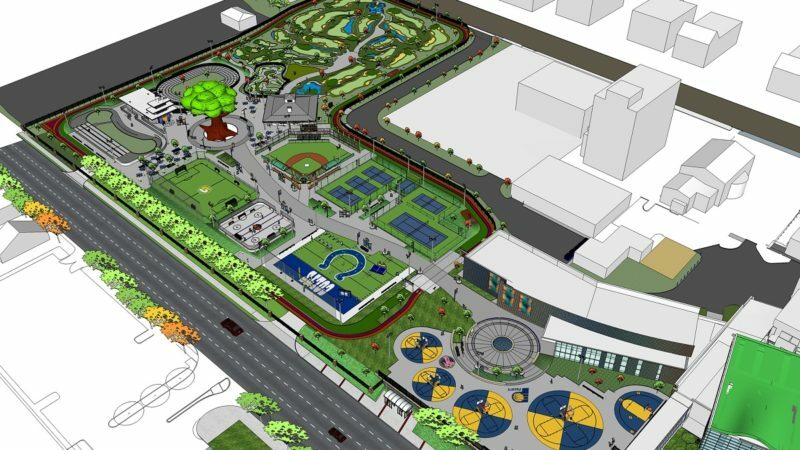 Examples include a sports-themed treehouse to climb in, a pedal car Indianapolis Motor Speedway (with a replica pagoda like the one at the speedway), and 16 basketball hoops at different heights so kids of all ages can play. It’s like an amusement park for sports loving kids and families. Also, it’s a great way to educate and encourage kids to be active. This drone video of the unfinished project will give you an idea of what it looks like. 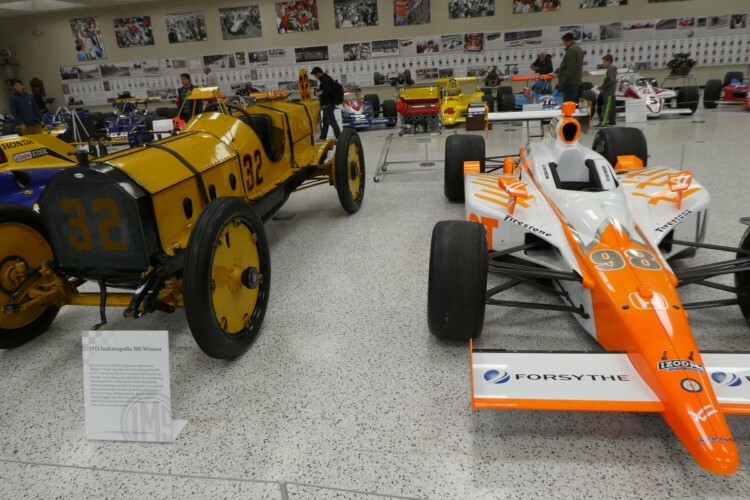 A museum filled with race cars from the past 100 years is part of a visit to the Indianapolis Motor Speedway. 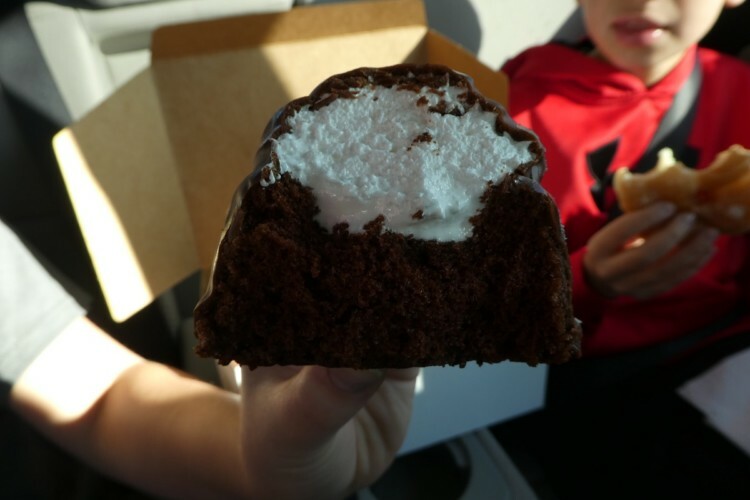 Photo by Jamie Bartosch/Suburban TravelingMom. Indianapolis’ most famous destination is the Indianapolis Motor Speedway. The enormous, legendary racetrack that’s home to the Indy 500. If you can see any race there, do it! Regardless, it’s still fun to walk through the museum. You’ll see dozens of race cars from the past 100 years (they are all surprisingly small!) in addition to cool memorabilia. Organized tours, which I’d recommend, allow you to go out on the track and “kiss the bricks” on the finish line like the winners do. It’s a cute photo op. 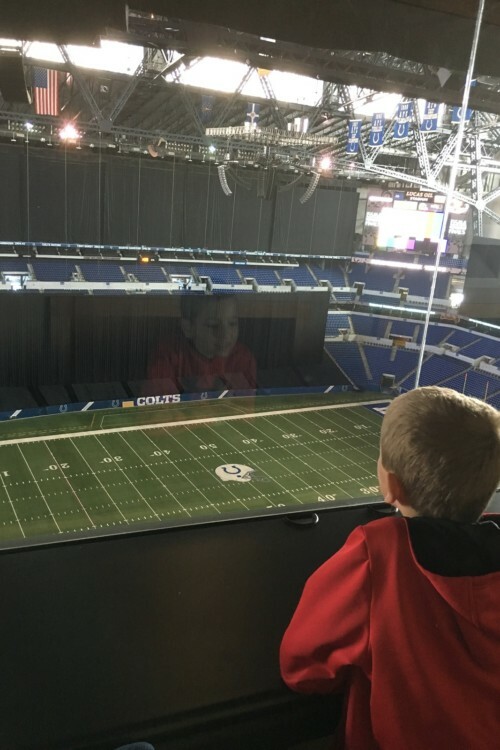 Football fans can tour Lucas Oil Stadium, where the Indianapolis Colts play. Photo by Jamie Bartosch/Suburban TravelingMom. The duckpin bowling alley is in the historic Fountain Square Theatre Building. Additionally, it has a “normal” bowling alley in a 1950s-themed basement. The duckpin bowling is in a window-lined room (a bowling alley with windows?!) with views of downtown Indy. 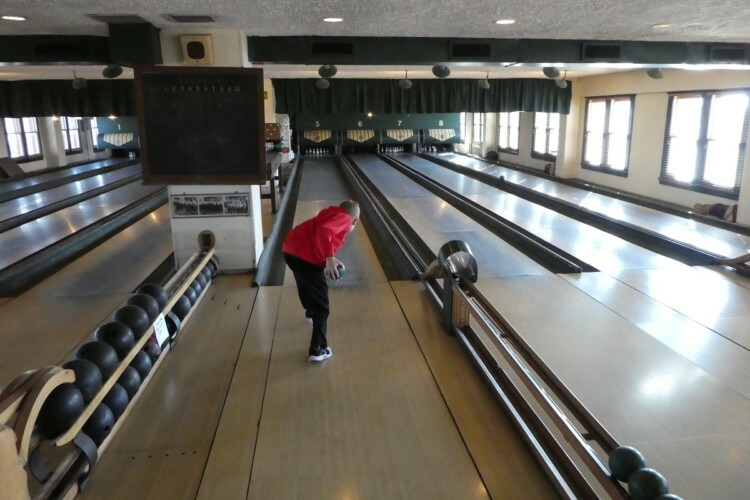 Families can try duckpin bowling at the Fountain Square Theatre Building in Indianapolis. Photo by Jamie Bartosch/Suburban TravelingMom. 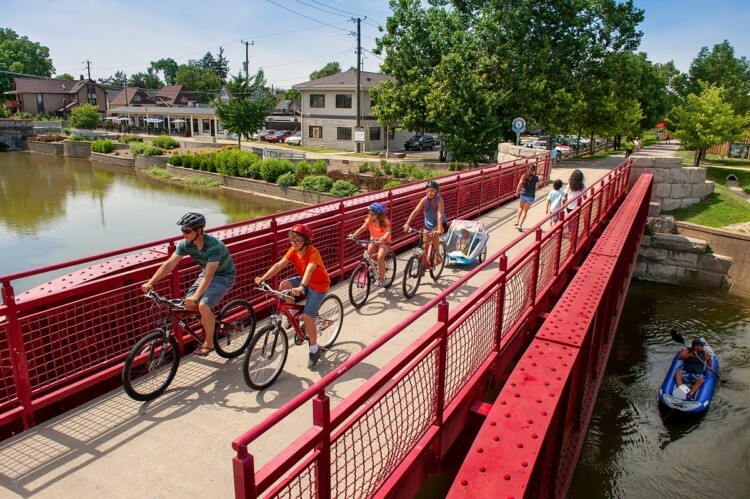 While there are many beautiful biking paths in Indianapolis, the 8-mile Cultural Trail is arguably the best. It winds through several downtown neighborhoods, and past $26 million worth of artwork as well as attractions like Monument Circle and great restaurants. Our pick for lunch? The juicy steakburgers and beer cheese tots at the new Burger Study on Georgia Street. It’s owned by the same people who run the city’s famous St. Elmo Steak House. Because there are 29 bike rental spots along the path, it’s easy to grab a bike and go. Indianapolis has beautiful bike paths, including the Cultural Trail and the Monon Trail, pictured here. Photo courtesy of Visit Indy. Indianapolis has a few aerial adventure parks, but TravelingMom Kirsten Maxwell recommends Koteewi Aerial Adventure Park. As she described in this post, families can climb, walk tight ropes above the trees and also take their own self-guided adventure over suspended bridges, wooden ladders and zip lines. 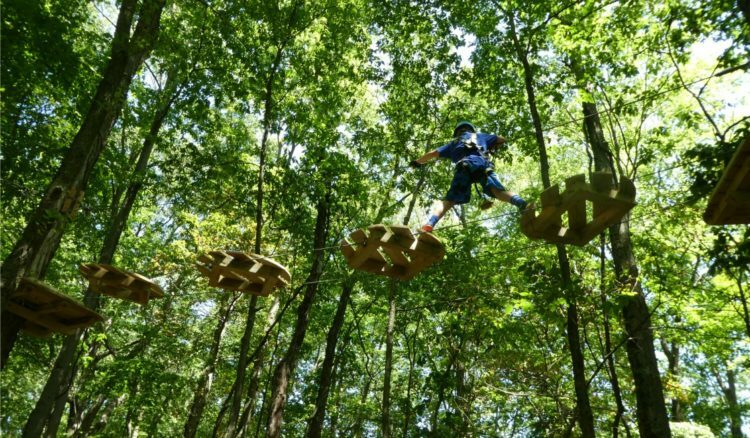 Additionally, Go Ape in Eagle Creek Park is another popular place for aerial adventures. Koteewi Aerial Adventure Park is not be missed! See the Indianapolis Indians – the AAA team for the Pittsburgh Pirates – play at Victory Field. 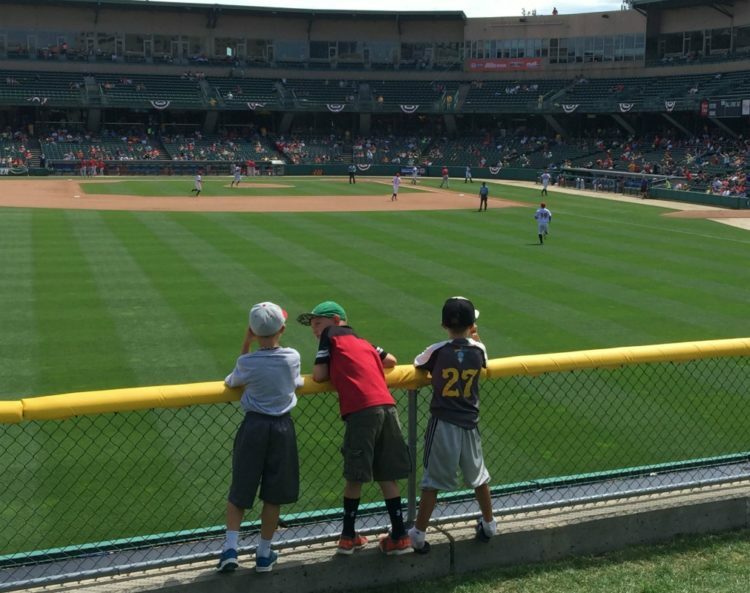 Most noteworthy, an Indy Indians game is affordable and includes lots of entertainment, according to this post byEmptyNest TravelingMom Cindy Richards. If you’re willing to stay outside the downtown area, we loved our room at the new Ironworks Hotel (opened in Oct. 2017). The modern industrial decor (dark wood, cast iron, exposed brick) includes eye-catching artwork. A framed photo of a whoopie cushion hung over our toilet. The large rooms have gorgeous picture windows, high ceilings, and a gigantic television. Just beware of the peek-a-boo showers. Your naked silhouette is visible to everyone in the bedroom area (fun for couples, not so much for families). Consequently, you can ask at check-in for something to cover the shower wall. Finally, the hotel has an outstanding breakfast/lunch restaurant, RIZE, which might be one of the best breakfasts I’ve ever had anywhere. No greasy bacon and eggs here; just super fresh food from Executive Chef Natalie Wall, like homemade blueberry jam on a tiny, thick English muffin, egg tarts and avocado toast. For dinner, try the nearby North End BBQ, appropriately ranked as one of Indy’s best BBQ joints. We practically licked the mac and cheese off the bowl; it was so good!